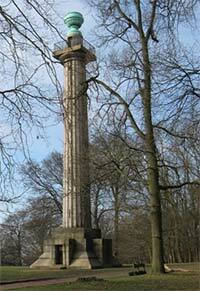 The high point of the estate's 4000 acres of woodland, heath and open parkland is the Bridgewater	monument. This fine 108 ft fluted column, which towers over the beech clad Chiltern Hills, was erected in 1832 as a memorial to the 3rd duke of Bridgewater, and is open to the public. Visitors can also enjoy the many miles of pathways and bridleways through the rich woodlands and across the wild open countryside. A wide range of activities and events for all the family take place through out the year. Little remains of the castle site today, except for its crumbling motte and bailey and a unique huge double moat. In its heyday it was one of the most important castles in England. Originally built just after the Norman Conquest - the later stone keep was owned by the Black Prince (eldest son of King Edward III) and was where King John of France was imprisoned. A small working aircraft museum dedicated to de Havilland aircraft manufacture. The hanger and surrounding site contains over 30 aircraft, including Tiger Moths, Mosquitos and Comets, plus a collection of de Havilland engines and other memorabilia. Little remains of the original Elizabethan mansion house, built by Sir Nicholas Bacon in 1563, except for a small chapel and clock tower. The later Palladian-style house, built by Sir Robert Taylor (circa 1774/84), was erected to host the family's growing collection of 17th century portraits. The house is a member of the Historic Houses Association and open for guided tours on Thursday afternoons during the summer months. 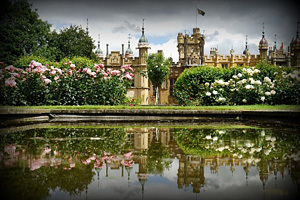 Knebworth began in 1492 as a Tudor manor house, built by Sir Robert Lytton, and has been the home of the Lytton family ever since. The exterior was later redecorated in Gothic style by Victorian novelist Sir Edward Bulwer-Lvtton. The formal gardens were originally laid out by Edwin Lutyens in 1908; they include a deer park, a maze, a herb garden by Gertrude Jekyll and a walled garden. Children can enjoy the dinosaur trail in the wilderness garden, a miniature railway and an adventure playground. Hatfield House, built by Robert Cecil from 1607 to 1611 in a traditional Elizabethan style, is the home of the 7th Marquess of Salisbury. The house is exquisitely furnished with beautiful tapestries, period furniture and many famous paintings. The house is enclosed by 42 acres of magnificent gardens, including a Jacobean formal knot garden, a scented garden and open parkland areas. Close to the house is the Tudor Palace of Hatfield, the	childhood home of Elizabeth I, where she held her first Council of State after she was crowned Queen in 1558. Situated at centre of Britain's first garden city, Letchworth's small town museum contains a range of exhibits on local wildlife, geology, arts and crafts and archaeology. The museum looks out onto the town's central park area (Broadway Gardens), which is lined by several other fine early 20th century buildings of note, including the town hall and an outstanding Art Deco cinema. 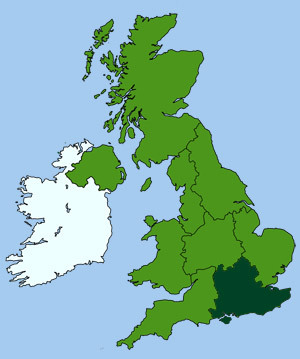 A ten minute walk away is the 'First Garden City Heritage Museum', which tells the story of Ebenezer Howard's dream to help people from slum areas to live in a more green and open environment. The Roman theatre, and other remains, were once part of one of the finest towns in Roman Britain, called Verulamium. Destroyed by Boadicea during the revolt of the Iceni, it was rebuilt almost immediately	afterwards. The large semicircular theatre site was unearthed in 1847 and would have accommodating over 2000 spectators during Roman times. Remains of the Many finds at the site are exhibited in the nearby Verulamium Museum. 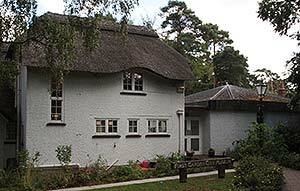 Shaw's Corner is an Edwardian house and garden in which George Bernard Shaw lived until his death in 1950 (aged 94). The interior decor and furnishings remain much as he left them, with many literary and personal effects on show. The generous rear garden has many mature trees, shrubs and richly planted borders, with views over the Hertfordshire countryside. 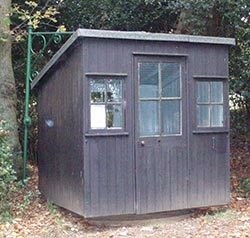 Near the bottom of the garden, hidden behind the trees, is Shaw's small revolving writing hut (shown here), complete with his pens, ink, glasses and old typewriter, just as he left them. The abbey church and gate house are all that remain of the original buildings from a 10th century Benedictine community. The church is the second	longest in England and became a cathedral in 1877. 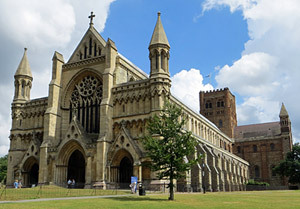 The original church was built on the site of the execution and burial of Britain's first martyr, St Alban, circa 250 AD. Parts of the cathedral and gate house are built from recycled Roman masonry scavenged from nearby Verulamium. Close by, Georgian buildings line a street leading down to the river and a water mill. Part of the Natural History Museum (London), it houses thousands of preserved and mounted mammals, birds, fish and insect specimens, portrayed as they would have looked when they inhabited the world's forests, hills, plains and seas. The red-brick Victorian house and its collection were once owned by the scientist and collector Lionel Walter Rothschild. The property and its contents were given to the nation in 1937 after his death, by the Rothschild family. Remains of the Roman city of Verulamium, including its theatre and city wall, lie on a grassy site south-west of the centre of St Albans. Many finds from the site, including superb mosaics, are exhibited in the Verulamium Museum.